Khalil Mack (born February 22, 1991) is an American football defensive end and outside linebacker for the Oakland Raiders of the National Football League (NFL). He played college football at Buffalo, and was drafted by the Raiders fifth overall in the 2014 NFL Draft. Mack holds the all-time NCAA record for forced fumbles and is also tied for career tackles for loss in the NCAA. In 2015, he became the first first-team All-Pro in NFL history to be elected in two different positions in the same year, as a defensive end and outside linebacker. Mack was raised by his parents, high school sweethearts Yolanda, a teacher, and Sandy Mack, Sr., a program specialist, in Fort Pierce, Florida. He has an older brother, Sandy, Jr., and a younger brother, LeDarius. His father introduced him to sports at the age of five years. Mack took an early liking to baseball and basketball although he did play Pop Warner football. Mack attended Fort Pierce Westwood High School in Fort Pierce. He had been relying on basketball to get him a college scholarship but his plans were dashed by a tear in his patella tendon before his sophomore season. After this injury, high school football coach Waides Ashmon recruited him to the sport, promising Mack and his parents that it would earn him a scholarship. After redshirting as a freshman in 2009, he broke into the starting lineup and was one of the most productive defenders in the MAC. He totaled 68 tackles, including 14 and a half for loss, four and a half sacks, ten pass breakups, eight quarterback hurries and two forced fumbles. He earned third team all-conference honors. He chose to wear the uniform number 46, an unconventional number for a linebacker, as a motivational reminder that his true potential was not being recognized - 46 was the overall rating assigned to him (out of a maximum of 99) in EA Sports' college football video game, NCAA Football 11. Mack continued where he left off in 2010, with a dominant sophomore season. Mack led the team in sacks, tackles for loss and forced fumbles, on the way to being named first-team All-MAC. He recorded 64 total tackles, including 20 and a half for loss (third best in the nation), five and half sacks, one interception, two pass breakups, thirteen quarterback hurries and five forced fumbles. Despite being suspended for the first game of the season following an altercation with teammate wide receiver Fred Lee, Mack set career highs in tackles (94), tackles for loss (21 - fourth in the nation), and sacks (8). He also recorded two pass breakups, four quarterback hurries and four forced fumbles. He earned first team all-conference honors for the second consecutive season. Starting all 13 games, Mack recorded 100 tackles including 19 tackles for loss, 10.5 sacks, three interceptions, one which he returned for a touchdown, and forced five fumbles. He won the CFPA Linebacker Trophy for the 2013 season, and he was named the 2013 MAC Defensive Player of the Year, becoming the first Bull to win the award in Buffalo's history within the MAC (1999-present). He was also named a second-team All-American by the Associated Press. Mack finished tied for first for the NCAA in career tackles for loss with 75 and set a new record for forced fumbles with 16. Buffalo's independent student newspaper, The Spectrum, also ranked Mack as the best UB football player in the Division I history of the program. Leading up to the draft, Mack was projected as a high first round pick in the 2014 NFL draft in many mock drafts. He was selected with the fifth overall pick by the Oakland Raiders, making him the highest selected Buffalo player ever, and the first (and only) selected in the first round. Previously, the highest selected player was Gerry Philbin in 1964. He chose to switch from his college uniform number, 46, to 52 in order to comply with the NFL's numbering rules. By the end of the season, Mack was considered a candidate for AP Defensive Rookie of the Year. Mack eventually finished in third place in Defensive Rookie of the Year voting behind defensive tackle Aaron Donald of the St. Louis Rams and linebacker C. J. Mosley of the Baltimore Ravens. He was, however, named the Defensive Rookie of the Year by analysts on ESPN's NFL Live and was one of three linebackers selected to USA Football's sixth annual All-Fundamentals Team (the others being All-Pro veterans Luke Kuechly of the Carolina Panthers and Tamba Hali of the Kansas City Chiefs). In March 2015, the NFL amended the league's uniform numbering rules to allow linebackers to wear the numbers 40-49. As a result, Mack considered reverting from the number 52 to 46, the number he wore during his college career, but ultimately did not do so. In August 2015, Mack was named as the NFL's number one "making the leap" player. Before the start of the season, Mack shifted from linebacker to right defensive end, and plays at both positions. 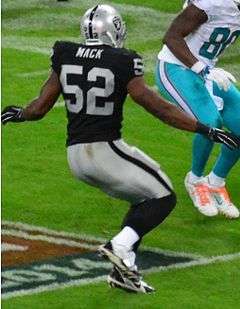 On December 13, Mack finished a game against the Denver Broncos with five sacks, tying a Raiders franchise record for sacks in a game, previously set by Howie Long in 1983. The game, which the Raiders won 15-12, was the franchise's first over the Broncos since September 2011. The following week, Mack was announced to be going to the Pro Bowl, his first, along with teammates Charles Woodson and Marcel Reece. After the conclusion of the season, Mack became the first player in NFL history to make the AP All-Pro First Team at two different positions in the same year. On November 27 in a 35-32 victory over the Carolina Panthers in Week 12, Mack recorded the first pick six of his career off of Panthers quarterback Cam Newton, and returned it for his first career touchdown. Mack also forced a fumble from Newton in the final minute of the game to seal the win for the Raiders. Mack finished the game with an interception, a sack, a forced fumble, a fumble recovery, and a defensive touchdown, making him the first player since Charles Woodson in 2009 to do so. His performance earned him AFC Defensive Player of the Week for Week 12. Mack also earned AFC Defensive Player of the Month for November, registering four sacks, two forced fumbles and an interception. Mack taught himself to play guitar as a freshman at the University at Buffalo and enjoys singing and writing music. His reputation as a singer has led Raiders teammates to attempt to goad him into singing R. Kelly and Usher songs. He is a fan of musicians Tim McGraw and John Mayer. Mack is an active Christian and spent much of his youth attending a church where his father was a deacon. Mack also enjoys spending time with his nieces, Maayana and Ma’kiyah, and counts his favorite film as Mary Poppins. 1 2 De Guzman, Zaimarie (May 5, 2014). "Khalil Mack still humble guy from Fort Pierce despite high NFL draft prospect". Treasure Coast Newspapers. Retrieved 9 May 2015. ↑ Rickman, Martin (November 19, 2013). 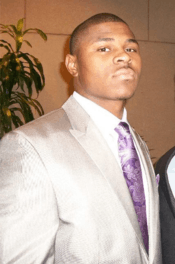 "Anything but ordinary: Buffalo senior linebacker Khalil Mack's rise to stardom". Sports Illustrated. Retrieved 9 May 2015. ↑ "Khalil Mack". Rivals.com. Retrieved May 10, 2014. 1 2 3 Mansfield, Aaron (August 30, 2013). "Return of the Mack". The Spectrum. Retrieved 9 May 2015. ↑ Riordan, Tim (August 21, 2012). "Buffalo's Khalil Mack Suspended". Bull Run. SBNation. Retrieved 9 May 2015. ↑ Lassan, Steven (June 20, 2012). "MAC Football 2012 All-Conference Team". Athlon Sports. Retrieved May 10, 2014. ↑ Simon, Mitch (December 4, 2013). "Khalil Mack Named MAC Defensive Player of the Year". WKBW. Archived from the original on January 4, 2014. Retrieved May 10, 2014. ↑ "AP All-America Team, List". Associated Press. December 17, 2013. Retrieved May 10, 2014. ↑ Huguenin, Mike (November 20, 2013). "Buffalo LB Khalil Mack breaks record shared by Terrell Suggs". nfl.com. Retrieved May 10, 2014. ↑ Huguenin, Mike (November 20, 2013). "Jeremiah: Buffalo's Khalil Mack is surest thing in 2014 NFL Draft". nfl.com. Retrieved May 10, 2014. ↑ Mansfield, Aaron (May 8, 2014). "Top 10 of the D1 Era - No. 1: Khalil Mack". The Spectrum. Retrieved 9 May 2015. ↑ Burke, Chris (January 9, 2014). "2014 NFL Mock Draft 4.0". Sports Illustrated. Retrieved May 10, 2014. ↑ "2014 NFL Mock Draft". Walter Football. Retrieved May 10, 2014. ↑ Pompei, Dan (May 8, 2014). "THE FINAL MOCK DRAFT". Sports on Earth. Retrieved May 10, 2014. ↑ "Raiders Draft LB Khalil Mack in 1st Round" (Press release). Oakland Raiders. May 8, 2014. Retrieved May 9, 2014. ↑ "Khalil Mack". nfl.com. Retrieved May 10, 2014. ↑ Graham, Tim (December 18, 2014). "While others hit NFL rookie wall, Raiders' Khalil Mack plows ahead". Buffalo News. Retrieved 9 May 2015. ↑ Dubow, Josh. "Breaking Down Khalil Mack's Rookie Year". CBS Local. Retrieved 9 May 2015. ↑ Sessler, Marc (January 31, 2015). "Aaron Donald nets Defensive Rookie of the Year honors". NFL. Retrieved 9 May 2015. ↑ "Mack Named ESPN's "NFL Live" DROY". Oakland Raiders. January 20, 2015. Retrieved 9 May 2015. ↑ "26 NFL players named to USA Football's All-Fundamentals Team". National Football League. December 10, 2014. Retrieved 9 May 2015. ↑ Damien, Levi. "New NFL rule allows Khalil Mack to wear college number, he wants to know: 46 or 52?". Silver and Black Pride. SB Nation. Retrieved 9 May 2015. ↑ Orr, Conor. "Making the Leap, No. 1: Khalil Mack". NFL.com. Retrieved 20 August 2015. ↑ "NFL: Raiders list Mack as defensive end". San Jose Mercury News. Retrieved 20 August 2015. ↑ Hanzus, Dan. "Khalil Mack unstoppable as Raiders upset host Broncos". NFL.com. Retrieved 14 December 2015. ↑ Lam, Quang M. (December 1, 2016). "Marcus Mariota, Kirk Cousins among Players of Month". NFL.com. ↑ "Better Know A Draft Pick: Khalil Mack". UPROXXX. April 16, 2014. Retrieved 9 May 2015. 1 2 3 "Fast Facts About Khalil Mack". Oakland Raiders. August 25, 2014. Retrieved 9 May 2015. ↑ McDonland, Jerry (June 19, 2014). "Raiders rookie linebacker Khalil Mack unconcerned about great expectations and is looking forward to training camp". Bay Area News Group. Retrieved 9 May 2015.